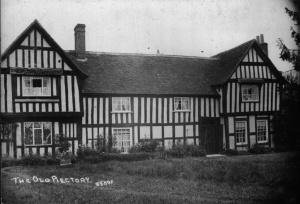 The Old Rectory, originally of course called The Rectory, was, for many years just cottages. The Annesleys, Rectors for many years, lived at The Manor, and the Rev Pippet had a house built for himself and his family at Red Hill, so, for all that time, the black timbered house with white wattle and daub near the Church, was occupied by villagers. Mr. and Mrs. Betteridge lived in two rooms. Their front door faced the Churchyard and opened straight into their living room. To get to their bedroom and storage room upstairs, they used the main staircase; the rest of the house being bolted off. The delightful sloping back-bedroom was used by them for storing apples, and below this was the room where Mrs. Betteridge salted the pig. Mr. Betteridge had great difficulty in walking towards the end of his life, and for many years beforehand had trouble with his legs, so all the work was left to his wife. She was a marvellous lady, always ready to sell the best of her eggs to anyone who came to the door, Eggs were bought from The Rectory and milk bought from The Hollies across the road, so it was a very busy part of the village at one time. Mrs. Betteridge wore clogs (and she was one of the last to wear the white bonnet so common years earlier), and the echo of her clogs on the stone-flagged floor could be heard the moment you knocked at her front door. She kept poultry (which she killed and dressed herself), ducks and pigs. The ducks filled the orchard and would always drift down to the river. Regularly at sundown, Mrs. Betteridge would clip clop down to the river calling, “Come on! Dil! Dil! Dil!”, and would be answered by several hundred “quacks” from all directions, and most of the ducks answering didn’t even belong to her! They just liked the sound of her voice coming to them across the water. Mr. Betteridge, when his legs would permit him, was a bellringer and regularly every New Year’s Eve after ringing the New Year in, would invite the other four bellringers back to his home for a good supper of rabbit pie, cooked specially for the bellringers by Mrs. Betteridge. The rabbits were supplied by Nipper Livey (real name Enoch) from Cold Comfort Farm, and what a delicious spread it was! The only time he could not join his fellow ringers and friends, was on Boxing Day. This was the day the ringers sang more than rang. Unfortunately for Mr. Betteridge, they walked too – round to all the farms, singing. However, Mrs. Betteridge would invite them all in when darkness came and the walk finished. Then, with stomachs full of rabbit pie (again!) he would join them ringing a peal. Mrs. Betteridge would also give them warm cider with a little ginger heated on her stove in her enamel saucepan. Very sadly Mrs. Betteridge did not have a pleasant ending to her life. She had moved to No 13 to make way for the new Rector, and fell down the stairs one morning. Harold Mole found her late afternoon. He opened her back door to get her milk jug (he was delivering milk at the time), and found her lying at the foot of the stairs unconscious. She had been there many hours, and never recovered. Mr. and Mrs. Franklin lived in the middle section of The Rectory. The only thing that can be remembered of Mrs. Franklin was her taking the baby out for an airing in his pram. Puffy Wheeler (baptised Charles) and his wife lived in the kitchen end of The Rectory. He would come to the door puffing and blowing through his whiskers. I think it is he I have to thank for my son’s expression on referring to the death of anyone as “kick the bucket”! Evidently, Puffy Wheeler shouted this to my father-in-law, Len Salmon, every time he saw him with his rabbits when Puffy was out delivering the dough cakes and flour. “That rabbit will kick the bucket before long”, he would shout. My father-in-law used the expression in front of James – hence the consequences. Puffy worked as delivery boy for the other Mill on the main road. Mrs. Rees-Mogg was the Patron of the Church and it was she and not Gloucester who decided that Canon Brookes would be an ideal Rector. The Rev Pippet having died, his widow and daughter stayed on in the house he had built. Therefore Canon Brooks had nowhere to live except The Rectory, and the tenants had to leave, Mrs. Rees-Mogg finding cottages for them. She then paid for new wooden and tiled floors to be put over the stone flags. Eventually, in 1927, Canon Brookes moved in with his wife and 10 year old twin sons. As well as looking after the spiritual needs of Clifford, he also looked after Atherstone, and I should think he was the only Vicar to work under two Bishops – Coventry and Gloucester! Services at Atherstone I think were on a Sunday afternoon and in the fine weather he cycled across the fields to take the services. 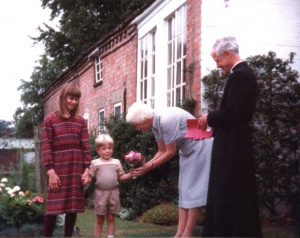 As well as that afternoon service, he had the usual services at Clifford, plus visiting the village school regularly every week to take services there. Canon Brookes was a small man with a nasal tone to his voice, but he was a brilliant speaker. He had been Canon of a large Church and congregation, but on developing heart trouble, was advised to seek a smaller parish. Talk of his sermons spread, and soon a Stratford Blue double-decker bus arranged by the Manager of the Company, was booked every Sunday evening to bring people from Stratford to the service. To get a good seat, people needed to arrive half-an-hour before the service! Twice, morning service on the BBC was broadcast from our Church with Canon Brooks as preacher. He retired in 1954 and Rectors after that had a lot to live up to. Rev Brown who came after him, died very suddenly – almost at his post. He had attended a meeting at Atherstone, I was told, to discuss its future association with Clifford, and died on returning home. However, when the Rev Lake arrived on the scene, he made it quite obvious he did not like the idea of serving two Bishops. The Bishop of Coventry tried to persuade him to stay with Atherstone but it seems he wasn’t successful. The Rev. Lake was a jolly man with a great sense of humour. He had been prisoner of war and in one of his sermons, gave a demonstration of one of his activities while in prison. He mimed opening a prison window, then roared out in a melodious but extremely loud singing voice, the chorus “Let the blessed sunshine in; let the blessed sunshine in; open wide the windows, open wide the door. Let the blessed sunshine in” He called on Betty Harris one day while she was having a bath. Not knowing who the caller was, Betty shouted out where she was, knowing that with the bathroom next to the front door, she would be heard clearly. The Rev. Lake’s reply was, “Would you like me to come and scrub your back?”! Canon. Patterson came next, and found himself serving Clifford and Marston Sicca. (Incidentally, from old Parish Records, I have found out that Clifford applied to Marston Sicca District Council for anything to do with roads, hedges, ditches.). Canon Patterson was a bachelor needing a housekeeper. The elderly housekeeper he brought with him, became so elderly she could no longer do the work required. As no other housekeeper turned up to take her place, Rev. Patterson had to leave. 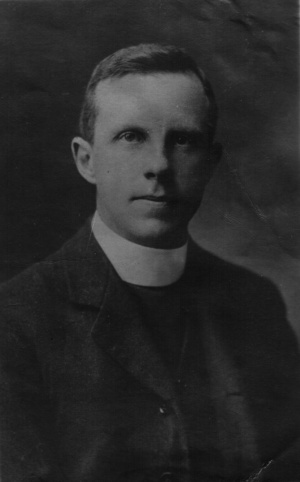 The Rev David Leonard-Williams was the next Rector to live at The Rectory with his energetic wife and two young lads, plus - living along the village street - his delightful and prayerful mother-in-law. Up until they arrived, the Sunday School was always held in the Church vestry on a Sunday afternoon, though when Rev Pippet had been the Priest in Charge, the children met at Red Hill House.. Now, with a young family, the Leonard-Williams encouraged the children to meet on a Sunday morning in one of the big rooms at the Rectory. The villagers were delighted when, after Rev Leonard-Williams left, they found out that Canon Hawkins was coming as Rector. They had never met him, or heard his preaching, and as most of his preaching had taken place in Nigeria, this wasn’t surprising. The person they did know well, was his wife. They had known her and her twin sister since the girls were 10, when they came to play with their twin cousins in The Rectory – for Mrs. Hawkins and Miss Talbot, her sister, were the nieces of Canon Brooks! Canon Hawkins was a very shy and gentle man who had witnessed great suffering during the civil war in Nigeria, both those in grief over the loss of loved ones, and those who were going through the trauma of killing a fellow human-being. His shyness made him put a great effort into his work. He visited everyone who was ill – even those who were suffering from nothing more than a common cold! He took the childrens’ services, teaching them new songs by singing them unaccompanied. One time he surprised the choir when our organist became ill one Sunday and there was no time to find a replacement. After announcing each hymn, he came into the choir pews and with an, “Excuse me” to the choir, climbed over the back of the choir pew onto the organ seat, switched the organ on and played the hymn,. Once the hymn finished, he switched off the organ, climbed back over the seat and back to his seat to take the next part of the service, until he announced the next hymn. Mrs. Hawkins and Miss Talbot conducted the Sunday School with Miss Baker the village headmistress. They organized a yearly bonfire night with hot soup and jacket potatoes. The Rectory was constantly open to everyone and anyone – every room in fact – to such an extent we all felt The Rectory was our home too. The Sunday School was held there, one class being in their dining room, another in their living room, another in the Rectory’s study and teenagers in their kitchen where delicious smells would be coming from their Rayburn. The garden was a joy to be seen, for both Mrs Hawkins and Miss Talbot were very keen gardeners. 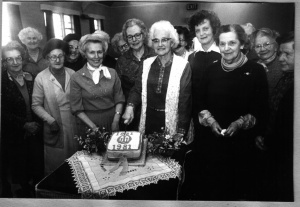 The Mothers Union held their meetings in their living room. – and we missed The Rectory too, for Gloucester Diocese had decided the up-keep of The Rectory was too high. Also, we had lost our connection with Marston Sicca and were now joined with Welford. 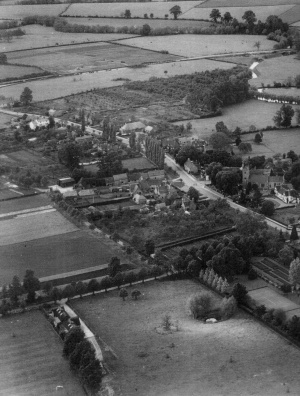 Welford was the larger village; therefore the Rector from now onwards would live at Welford. Gloucester Diocese sold The Rectory to its present owner. Residents in a tiny South Warwickshire village are calling on a Bishop to reconsider the closing of their 16th Century Rectory. “We have lost our shop, our post office and our village school – this was just the final straw”, said mother of three Mrs. Avril Salmon, who organized a 250-name petition protesting at the move. The Committee say that the Rector, the Rev. David Hawkins – or his successor when Mr. Hawkins retires in two years' time – should be based in Welford because it is the most densely populated of the three villages. But Mrs. Salmon says that the Rectory is used as a social gathering point for numerous local organisations and they fear that if it is closed, the village's Sunday School for one might be unable to meet. The petition signed by nearly every member of the Parish, has been presented to the Bishop of Tewkesbury, the Rt. Rev Robert Deakin, who is chairman of the Pastoral Committee. Villagers are also worried that the Rectory could be sold to some-one with no interest in the village, or even turned into a hotel or tea shop. This page was last modified on 27 February 2014, at 22:07.